There are certain events in the destiny of a nation which turn out to be a defining moments. 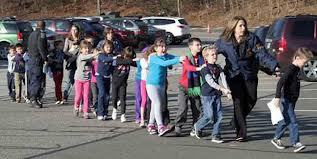 I believe the massacre at Newtown Ct. is one of them. It is a defining moment not only because of the ghastly nature of the crime but also its causes. The current narrative starting from the President downwards is that the widespread availability of the guns is to be blamed. On the other end of the spectrum the NRA is making the strange proposal of making every school teacher be armed. Under normal circumstances it would have been darkly amusing. Sure guns have something to do with it, but they are manifestation of the root cause. Lance Armstrong’s inspirational book titled ‘It’s Not About the Bike’ looks beyond what is obvious and takes the reader deeper into what really matters. What happened in Newtown can happen in any town in the USA, because the environment has been primed by the policies formed by the US government at the end of the Vietnam war. The image of children running away in the My Lai massacre changed the opinion of Americans against the Vietnam war. It eroded the blind trust that Americans had put in their governments and things have never been quite the same. The bitter lesson learned by the policy makers from this experience was to end the draft and not to allow journalists into the battlefield or document the returning body bags. This freed them from having to send their kids to the battlefields and to control the narrative of the events for American consumption. Anyone who stood in the way was either dehumanized or branded as unpatriotic. The net result has been the steady growth of callouses of lack of empathy and compassion in the collective and individual behaviors. The thing that strikes people visiting Yale campus is that there are ZERO alum deaths after the Vietnam war listed on the walls of the buildings honoring those that had died in wars. While the US policy makers and think tanks are predominantly from the two coasts, the bulk of fighting force is from middle America and minorities dominate the enlisted ranks. This severing of nerves by the policy makers has allowed them to launch into wars without exhausting all peaceful options. The pain of never ending wars is no longer felt. The President instead asks the populace to go shopping. I immigrated to the US in the eighties when it was considered the country that spearheaded human rights, individual freedoms and rights. It is now a emotionally and psychologically scarred one. Where one shoe bomber has eternally condemned all Americans to take their shoes off when boarding a flight; where water boarding and torture of suspects is considered acceptable collateral; where civil rights have been severely compromised under the guise of national security; where targeted killing of hundreds in not thousands of innocent people using drones controlled from across the world does not even make the news. The drones have been shown to be not only a blunt killer but more importantly it has psychologically traumatized a whole generation of children by its very presence in the skies over Pakistan. There is hardly a single American lawmaker who has raised a single voice against these nearly daily My Lais that are being committed in our names. In the last election only Ron Paul was the only presidential candidate who questioned the wisdom of the war in Afghanistan and was booed by the audience fed by corporate controlled media. The corporations now carefully control the so called presidential debates so that there is nothing controversial that can disturb the carefully crafted narrative for public consumption. It was not long ago that League of Women used to moderate these debates. There were third parties given a fair amount of air time to provide alternatives to the two main parties. The corporations and individuals had to publicly disclose how much was being contributed to whom. Super PACS can now legally influence the electoral process without having to disclose who they are and how much they are contributing. The corporate America dominated by defense and oil industries, amongst others, have essentially hijacked the essence of democracy in America for the bottom line. Both parties have nearly similar policies where it really matters. So it was not surprising that Obama who came on the promise of CHANGE ended up keeping the Bush Secretaries of Defense and Treasury. No amount of gun control will avert future massacres in America till we set ourselves on a path that makes us a more empathetic country. In order to get there we need to reverse the changes that were made that got us where we are. We need to make democracy functioning again. This will only happen when we make the electoral process truly transparent. We restrict the influence of corporations and increase that of voters. We allow third parties to have a voice in the electoral process. We make draft compulsory for the graduates of top one hundred Universities in the US. No lawmaker at any level can run for an office without their children being drafted. We have a military that allows journalist access to battle just as we did in Vietnam. It would be only after these changes that we will have an informed populace who can make decisions that reflect our values. We would have lawmakers and elite who feels the pain of wars. We will have regrown the nerves necessary for the long term prosperity of the country. The Golden Rule: Do Unto Others as You Would Want Them To Do Unto You…. Jimminy Cricket: Let Your Conscience Be Your Guide…. Then we will continue to make irrational decisions. This process does require common sense and sanity. When these principles are not in place, mayhem will happen. Well written I agree with all four recommendations given in the post. It will be difficult to get any of these implemented, however, this is the only way forward if we are serious. Very well thought out Imran. A common sense prescription that all should agree on. Politics shapes perception of reality for many, and the draft, military openness, a pluralistic political system and other necessary reforms are unfortunately not in any ones view of reality. On the gun topic, it was shocking for me to read in yesterdays paper that Colleges are the new front in gun rights advocacy. “Love thy neighbour” is being replaced by “Protect yourself from your neighbour”. Watch the video on Neo Con perception management of US public on this video.